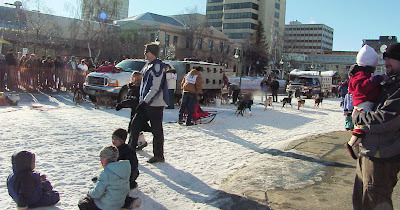 I mentioned yesterday, we spent a gloriously sunny Sunday afternoon in Anchorage at the Fur Rendezvous. 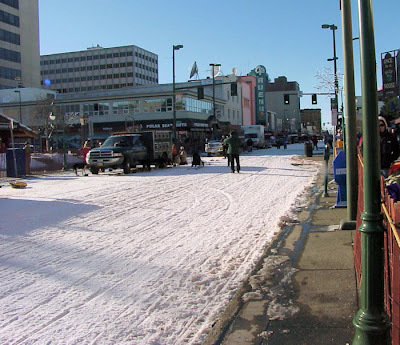 For those of you from more mundane places, the Fur Rendezvous - or Fur Rondy, or more often just 'the Rondy' - is a two week long winter festival held annually in downtown Anchorage in one form or another since about 1935 (except for during WWII. Portions of the Alaskan territory had been invaded and Anchorage was an Army camp on the edge of the Pacific theater then, and a damned serious place). For us, it signals the end of the long dark winter months and the coming Break-up (we don't have 'spring' here, the foul brown and muddy period between Winter [yes, with a capital 'W'] and summer is called Break-up. Yep, you just learned something). 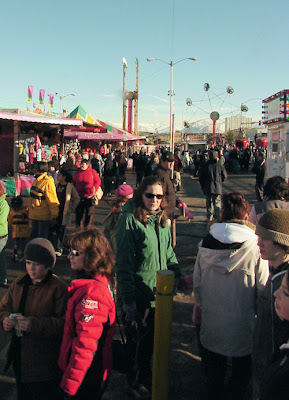 The term 'Fur Rendezvous' comes from the old semi-annual gatherings where trappers would come to the ice-free anchorage on Cook Inlet in order to sell their winter fur harvest, buy supplies, drink, socialize (read that as fight, weapons optional), get one of their twice annual hot baths, see a show, and maybe get down and do the wild thing with some of the local ladies. 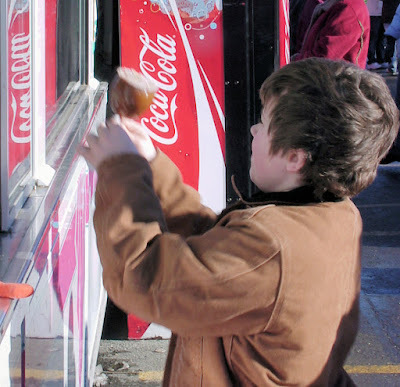 Nowadays, there's still a lot of socializing and drinking, a bit of fur trading and selling, and rumor has it that more than a few are still getting down with the wild thing. 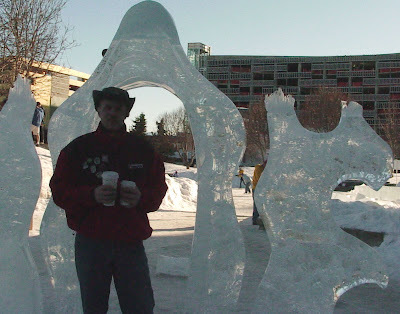 There's a carnival, and good food, and snow and ice sculpting contests, dog sledding, and reindeer in the streets. 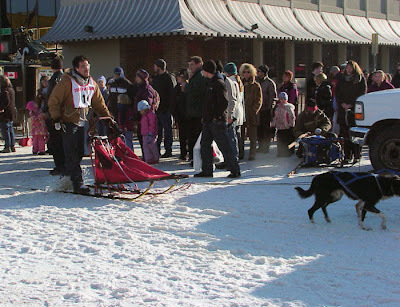 All of which leads to the biggest annual event in Alaska, the Iditarod Sled Dog Race - 1100 miles from Anchorage to Nome through some of the roughest territory on the planet. 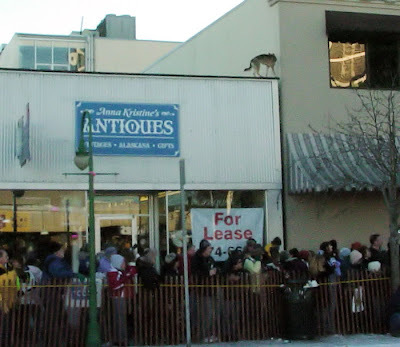 It's one of my favorite times of the year, here in Alaska - and if the crowds are any indication, it's pretty damned popular with everybody else too. As is our habit, we parked at the Anchorage train station near the port, in order to avoid the traffic and the expense of downtown parking. That's the train station and beyond it is the Port of Anchorage, check out those ice cubes in the water. Makes me cold just looking at it. The long covered stairway leads up from the station to 3rd Street, in the middle of downtown. 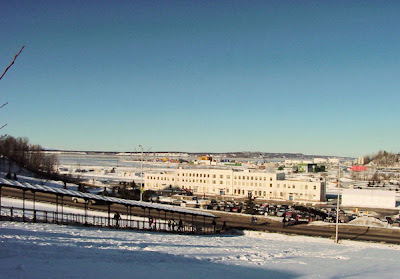 Since we were at the train station, we started with the snow sculptures, which are over in the train yard to the right of the station, out of frame in the above picture. The wife and I settled for Starbucks. 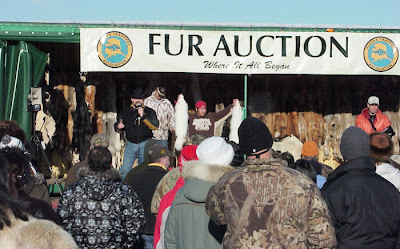 We stopped by the 3rd Street Fur Auction and watched millions of dollars worth of animal hair change hands and listen to the auctioneer. Probably not something you see at a festival outside of Alaska. We don't get much in the way of protesters here, and the pelts are gorgeous. In the below picture Linux guy (the gent in the red hat - get it?) is holding up a matched pair of Arctic fox winter pelts - I think they went for $150 a piece, which is a damned good price. A dozen more and you'll have fine warm coat. These will probably end up as hats. 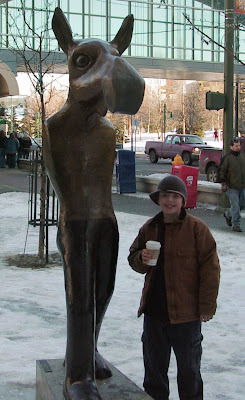 My son, drinking hot chocolate next to one of Anchorage's weirder sculptures. This year there was something new - the Reindeer Run. Hmmm. OK. See basically the idea is that 2000 fools paid $20 to run in the street with about ten Reindeer, ala the Running of the Bulls in Pamplona, Spain. 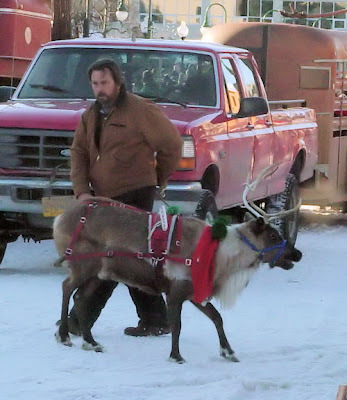 Couple of problems here, the biggest being that reindeer are the small sheep-like, passive, domesticated versions of caribou. Aggressive? Nope. Excitable? No, not really. Mostly they stood around - and it took a guy out front with a bucket of grain and several plucky folks behind with spray bottles full of wolf piss to get them to do more than just stand around and watch the crowd curiously. Basically, it ended up being a large mob of people running down 4th Street with a couple of reindeer tagging along like dogs at the start of the Boston Marathon. Everybody enjoyed it, including this dog - who had one hell of a sense of balance. He sat, lay down, and walked along that very narrow handrail for a full hour, watching the Reindeer Run and the people below, and you could tell he was enjoying himself immensely (don't worry, his owners were up there with him, and he was obviously very used to it and knew exactly what he was doing). Anyway, we had a great day and didn't get home until late. If you're ever in Alaska in the dead of the arctic winter, make sure you get to the Rondy, you won't regret it. Two weeks to the Iditarod. Can't wait. OK, who drew the short straws and had to stand sround with a spray bottle of wolf piss? I've always wanted to see the Iditarod. I had a Siberian Husky when I was a kid, and he was the most awesome dog. We certainly didn't get the kind of snow you all get in Alaska down in NJ, but he was in his element in the winter. 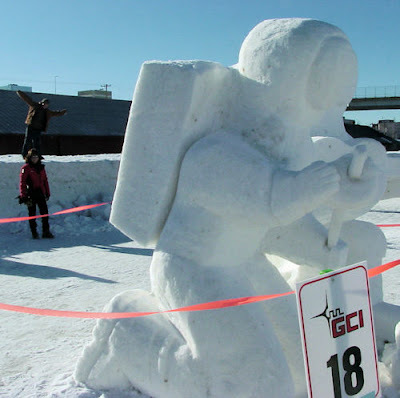 An indelible image in my mind is him climbing up the giant snow pile at the corner of the street (the pile that the snow plows desposit). He would stand there and HOWL. --sigh-- Someday I'll come out there for the start of the Iditarod. The reindeer run sounds hysterical. Jim, great pics. The real flavor of Anchorage. I noticed you wore the same hat and jacket as your blog pic. Do you ever change out of it? Tom, yes I change out of them, upon occasion. My wife also runs them through the wash once in a while. And that's actually not the same jacket. 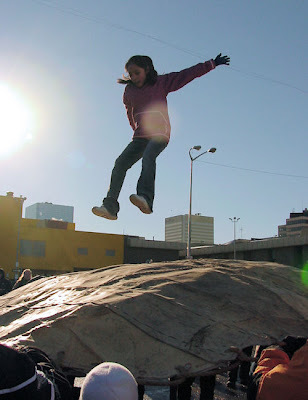 The jacket in my avatar picture is a Colombia River parka, way too warm for yesterday. The jacket in the picture is a polar fleece coat, in Horizon Lines colors (my wife is a manager for HL/Sealand in the Port of Anchorage). The pins on the breast are mostly Iditarod pewter pins, I get one each year when I enter the Iditarod raffle, I've gotten one every year since '96. I also wear a US Navy honorable discharge and Navy Retiremed pin on the collar, which you can't see in the picture. The hat is another story. I am very rarely without it. It was given to me by the Australian Joint Task Force Commander, following a particular incident in the Northern Arabian Gulf - one where I happened to be in a position to help out some Aussie crewman from the HMAS ANZAC who had got themselves into a bit of a jam one dark and stormy night. That hat means a great deal to me, it's not given out lightly and I may be one of the very few Americans who has one. Plus it's comfortable as all hell. John, I'm not sure how you get the job of Wolf Piss Spitzer, and frankly I don't want to know. Also I don't really want to know how it's collected. BTW, wolf urine, which you can buy online, is great for keeping white tailed deer out of your garden. Spray it around the edge of your property and they won't come anywhere near your vegetables. But beware if you happen to have amorous wolves nearby. Your garden could become the new lupine hot spot! "Hey there Little Red Riding Hood, you sure are looking good..."
I sure am glad to see the Rondy contuing on. My daughter told me last year that they were having problems with funding and would not hold it this year. Tess, yeah, it wouldn't be the same without the Rondy. I guess the Reindeer Run raised all kind of money, and I expect it'll become a regular event. No problems with funding this year, as far I know. I dunno, Saqib, I think I'd prefer the smell of WD-40 to cat piss! I've got wood peckers that periodically try to eat me house. I put out suet feeders, and the seems to draw them away from the house.